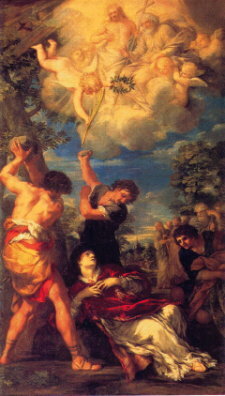 St. Stephen is well-known as the “protomartyr”, the first Christian to die for his faith. (Jesus doesn’t count.) There’s a St. Stephen’s Gate in Jerusalem so named for its supposed proximity to the site of the protomartyrdom. And Stephen, full of faith and power, did great wonders and miracles among the people. Then there arose certain of the synagogue, which is called the synagogue of the Libertines, and Cyrenians, and Alexandrians, and of them of Cilicia and of Asia, disputing with Stephen. And they were not able to resist the wisdom and the spirit by which he spake. Then they suborned men, which said, We have heard him speak blasphemous words against Moses, and against God. And they stirred up the people, and the elders, and the scribes, and came upon him, and caught him, and brought him to the council, and set up false witnesses, which said, This man ceaseth not to speak blasphemous words against this holy place, and the law: For we have heard him say, that this Jesus of Nazareth shall destroy this place, and shall change the customs which Moses delivered us. And all that sat in the council, looking stedfastly on him, saw his face as it had been the face of an angel. Howbeit the most High dwelleth not in temples made with hands; as saith the prophet, Heaven is my throne, and earth is my footstool: what house will ye build me? saith the Lord: or what is the place of my rest? Hath not my hand made all these things? Ye stiffnecked and uncircumcised in heart and ears, ye do always resist the Holy Ghost: as your fathers did, so do ye. Which of the prophets have not your fathers persecuted? and they have slain them which shewed before of the coming of the Just One; of whom ye have been now the betrayers and murderers: Who have received the law by the disposition of angels, and have not kept it. But he, being full of the Holy Ghost, looked up stedfastly into heaven, and saw the glory of God, and Jesus standing on the right hand of God, and said, Behold, I see the heavens opened, and the Son of man standing on the right hand of God. Then they cried out with a loud voice, and stopped their ears, and ran upon him with one accord, and cast him out of the city, and stoned him: and the witnesses laid down their clothes at a young man’s feet, whose name was Saul. And Saul was consenting unto his death. And at that time there was a great persecution against the church which was at Jerusalem; and they were all scattered abroad throughout the regions of Judaea and Samaria, except the apostles. And devout men carried Stephen to his burial, and made great lamentation over him. The persecuting “Saul” at the end of this text is, of course, Saul of Tarsus, the future St. Paul. Here’s a set of Catholic devotionals for the day, and here’s a more secular vibe on the day’s various quirky Anglo traditions. Good King Wencesla(u)s, a tenth-century Bohemian ruler, is himself a saint — the patron saint of the Czechs, as a matter of fact. Wenceslas was murdered in a palace coup, supposedly leading his servant Podevin to avenge that death, for which said Podevin was in turn executed. The lyrics of the song “Good King Wenceslas” celebrate the king and his loyal page undertaking together the charitable works they were famous for. * At least, it’s the Feast of St. Stephen in the Latin rite. The occasion is observed on Dec. 27 in the Orthodox tradition.